Manufacturer of a wide range of products which include single limb manometer, single limb well manometer and single limp manometer. Backed by rich knowledge, we have been able to satisfy the diverse needs of clients by providing Single Limb Manometer. Widely used for precision measurement of pressure, vacuum, differential pressure flow and liquid level measurement in various industries, this single limb manometer is manufactured from high grade as per the set market norms. The offered single limb manometer is accessible in different models, sizes and stipulation to meet the various requirements of the customers. In addition to this, our professionals are capable to modified this single limb manometer within the minimum time – frame & at affordable rates. We are leading manufacturer of single limb well manometer. 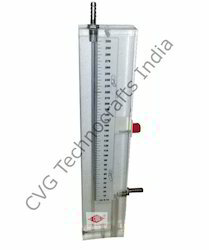 "CVG” make Single Limb well Type direct reading Manometers are used for precision measurement of pressure, vacuum, differentials pressure flow and liquid level measurement. Initially liquid is filled in the well till the scale shows zero but when a positive pressure is being applied on the liquid in the well, causing the level to go down very slightly. Liquid level in the indicating tube has risen substantially giving direct reading from scale in desired units. The single limb well type manometer are accurate & dependable as well as highly versatile for many applications. All Scales are graduated to correct for the drop in the well level.